Over the years, as the features and amenities at aquatic centers have changed, the value of admission has steadily increased. While aging swimming pools built in the 1970s and 1980s still charge a modest $1–$2 for admission, the family aquatic centers of the ’80s, ’90s and 2000s, with their various amenities, can easily charge $5–$10. The more and varied the amenities an aquatic center offers, the more guests it attracts, the longer they stay and the higher the admission fee that can be charged. The primary driver is the length of stay of their guests. With the rise of newer family-oriented aquatic centers, aging “flatwater” pools with low admission prices have seen a dramatic drop-off in attendance and use, correlating to higher subsidies. While attendance at these facilities can fall below 100 people per day, newer centers can exceed 500–750 guests per day. However, just because these aging facilities are subsidized at a higher rate does not mean they lack value. They still provide valuable instructional, competitive, fitness and recreational experiences to communities across the country. Many of these facilities are adding amenities, such as waterslides, climbing walls or an adjacent spray pad to increase their recreational value, as well as focusing on aquatic programs (swim team, water polo, summer camps) and partnerships with local swim teams and school districts to help increase usage of their facility. As municipalities take these older facilities offline and replace them with new ones, the number of aquatic construction projects has increased over the past several years. This, coupled with the rising cost and short supply of materials for aquatic facility construction, has caused a dramatic increase in the price of aquatic construction, sometimes at a rate of 5 percent every six months. Entities looking to build a new aquatic center need to factor in this current inflation rate when developing capital budgets to avoid having to scale back on their design should the bids come in too high. Spray parks have made a big splash as a common replacement for aging swimming pools, particularly because they still provide the community with aquatic experiences without the high operating costs of traditional pools. Spray parks do not require high levels of staffing, require only minimal maintenance and offer a no-cost (or low-cost) alternative to a swimming pool. They typically appeal to kids 2–12 year olds and can be a stand-alone facility in a community park or incorporated inside a family aquatic center. Another trend seen across the country pertains to the planning, designing and building of competitive swim venues by school districts. Over the past five to 10 years, school districts have taken the lead in building and operating competitive natatoriums primarily to provide space for their high school swim teams, but also as valuable lane space for local USA swim teams, water polo clubs, synchronized swimming and other community programs, such as swim lessons and water fitness. Several of these natatoriums also have a shallow, warm-water pool that the school district uses to start a water safety program for either second or third graders, since swimming is an integral skill for these students to learn. Municipal Aquatics — Go Big or Go Home! 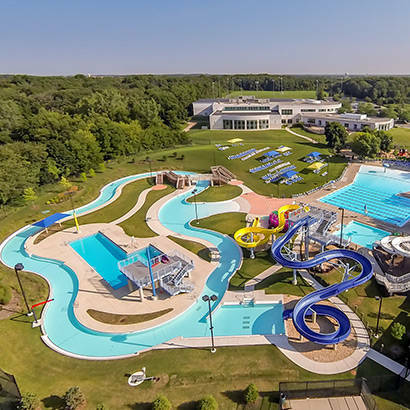 While school districts continue to build competitive venues, municipalities continue to build large outdoor recreational aquatic facilities that incorporate a greater number of aquatic features and attractions that were once reserved for the private waterpark sector. Features such as wave pools, large multilevel children’s play structures and extreme multi-passenger thrill attractions have become more and more commonplace as municipal aquatic facilities continue to provide aquatic experiences similar to those at larger, private waterparks, just on a different scale and, typically, at a lower price point. When it comes to the planning, design, construction and operation of an indoor aquatic facility, it makes sense to explore various partnership models in order to maximize the usage of an aquatic center, as well as to minimize the subsidy. A typical approach involves a school district teaming up with a local municipality to collaborate on the construction of a facility and then deciding which entity will be in charge of its operation, or if a third-party operator (such as a YMCA) will be brought in to manage and program the facility. This model helps to keep the pool filled the majority of the day and allows the operating costs to be split three ways instead of just one way. Whenever we talk about aquatic trends, sustainability — whether environmental or financial — usually rises to the top of the list. A variety of means exist for environmental sustainability, including LED lighting, variable frequency drives for energy efficiency and regenerative media filtration to save on water usage. In terms of financial sustainability, facilities look at tiered pricing models for both memberships and programming in order to maximize revenue based on demand, as well as at marketing themselves against all entertainment venues, not only other aquatic centers. This, in addition to the latest software that allows for detailed tracking of personnel hours, facility expenses and revenues, provides aquatic centers with several options to set up their operation for financial success. In addition to staying current about their growing and ever-changing industry, aquatic operators also need to stay tuned in to the needs and desires of their community in order to continue to offer quality aquatics programming and experiences. NRPA Facility Market Reports, which offer key data and insights about the market served within a 10-minute drive of an agency’s facility, are a great tool for agencies seeking to gain a greater understanding of the residents they serve. Another great resource of industry information will be the 2017 NRPA Annual Conference, which will include a new aquatic-specific education track. George Deines, AFO, is Project Director for Counsilman-Hunsaker.